The TRUE ES900 upright bike is designed for those seeking a realistic cycling experience. The ergonomic design is ideal for all riders and the aero bars provide great leverage for long distance sessions. Arm rests and a gel seat provide added comfort, and the universal seat post gives you the option of using a seat of your choice. Fore and aft seat adjustment offers a wide range of customization. 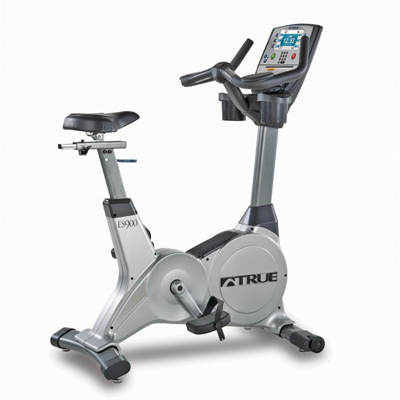 Buy TRUE Fitness ES900 Upright Bike - FREE SHIPPING! The TRUE ES900's superior brake and drive system ensure a smooth motion and quiet operation that is perfect for your home gym. Paired with TRUE's legendary patented Heart Rate Control technology and HRC Cruise Control, the TRUE ES900 maximizes your fitness investment. In essence, HRC pushes you to greater levels of fitness. Once you have reached your desired training level, simply touch the HRC Cruise Control button and it automatically sets your heart rate and keeps it there for the rest of the workout. The ES900 is manufactured with commercial-grade materials and the finest components for extreme durability. Coupled with a great warranty and service plan, you know that your bike will stand up to years of heavy use. The bike electrical parts and wear items are warranted for defects in material and workmanship for the above specified time period. This limited warranty does not cover damage or equipment failure resulting from or caused by improper assembly/installation, failure to follow instructions and warnings in owner’s manual, accident, misuse, abuse, unauthorized modification, or failure to provide reasonable and necessary maintenance. *TRUE Fitness shall not warrant the performance of the heart rate system on its products, as the heart rate system performance varies, based on user’s physiology, age, method of use and other factors. * This limited warranty shall not apply to software version upgrades. The bike cosmetic parts are warranted for defects in material and workmanship for the above specified time period. This limited warranty does not cover damage or equipment failure resulting from or caused by improper assembly/installation, failure to follow instructions and warnings in owner’s manual, accident, misuse, abuse, unauthorized modification, or failure to provide reasonable and necessary maintenance. This limited warranty will apply to but may not be limited to paint/coatings, covers/caps, badges, overlays, pedal, pedal strap and seat cushions.